Kamala Harris, Julian Castro and Kirsten Gilibrand are among the many who announced their candidacy for president. 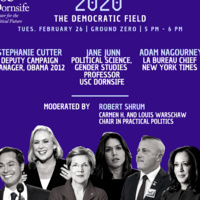 Join us on Tuesday, Feb. 26 to explore what's ahead for the Democrats and #2020. Stephanie Cutter- American political consultant. She served as Deputy Campaign Manager for President Barack Obama's 2012 re-election campaign. Moderated by Center Director Bob Shrum. Conversation from 5 to 6 p.m.
Free food at 4:30 p.m.